The portfolio had a good day yesterday, almost in spite of itself. Goldcorp had a glaring earnings miss and metals traded on the back foot, yet the stock clawed back early losses to close unchanged on the day. Meanwhile, a build in crude inventories was more than offset by sharp declines in product inventories, which provided a bit to crude and a pleasant upward jolt to the oil service stocks. OIH is now within shouting distance of Macro Man’s second offer at 145. EUR/JPY has come off its highs overnight, with a PBOC official noting that China does buy some yen for their FX reserves. That they then sell the yen 24 hours later was, strangely enough, left unsaid. Meanwhile, the stronger than expected Empire survey provided a jolt to bonds, taking the 10 year yield back north of 4.60. Finally, the Fed was hawkish enough in the October minutes to keep Treasuries on the back foot through the close and in the overnight session. Of course, the real test for bonds will come via the CPI and housing data released today and tomorrow. 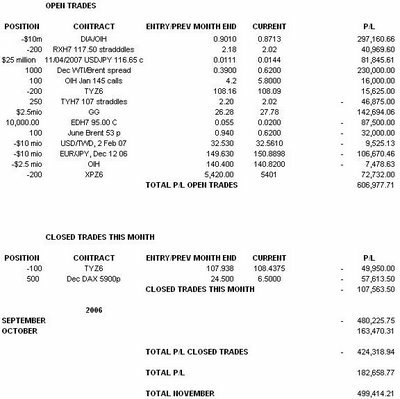 The TIC data is also released, with a new ‘improved’ methodology that accounts for short term flows, thus making the series even more erratic. The appropriate reaction to the number, whatever the result, should be a yawn. In terms of portfolio tactics, Macro Man has a net short equity bias which will be increased should profits be taken on another slug of the OIH position. This position will bear watching, as stocks could very well be in the melt-up mode that so often accompanies the end of the year generally and the third year of the presidential cycle specifically. If this proves to be the case, then some adjustment will be required. For now, however, Aussie equities are underperforming, which might lend itself to a long SPZ6/short XPZ6 spread trade. Yesterday, Macro Man provided some macroeconomic and financial rationales for why market volatility has been so low: namely, that the performance of major economies and asset markets are virtually indistinguishable at the moment. However, there are other forces at work, namely You-Know-Who, a.k.a. He-Who-Shall-Not-Be-Named, a.k.a. Lord Voldemort. In other words, the currency reserve managers of Asian and oil exporting monetary/investment authorities. Why does Macro Man collectivize these institutions into the catch-all phrase Lord Voldemort? For two reasons. The first is that these institutions tend to be very sensitive about their flow, and apply pressure to their counterparty brokers not to reveal what they are up to, as is customary with private sector flow. As such, brokers are generally afraid to report the source of their flow as ‘sovereign’, instead using rather tortured euphemisms when referring to what’s driving the market. This strikes Macro Man as similar to the euphemisms applied to Voldemort in the Harry Potter books. The more sinister parallel, of course, is that the influence of these institutions is everywhere in bond and currency markets, and threatens to overwhelm the smooth functioning of market pricing heretofore performed by private sector profit-maximizers. The sums that we are dealing with here are very considerable indeed. The rate of reserve accumulation of the key players has been virtually parabolic in recent years. 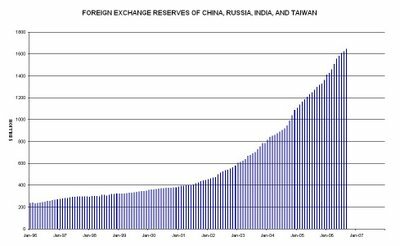 The chart below shows the combined currency reserves of just four countries- China, India, Russia, and Taiwan. Note the absence of countries like Korean and Malaysia, as well as the assets that have accrued to Middle Eastern investment authorities. Observe the scale on the left hand side of the chart. At the beginning of 1996, these countries had $235 billion in currency reserves. 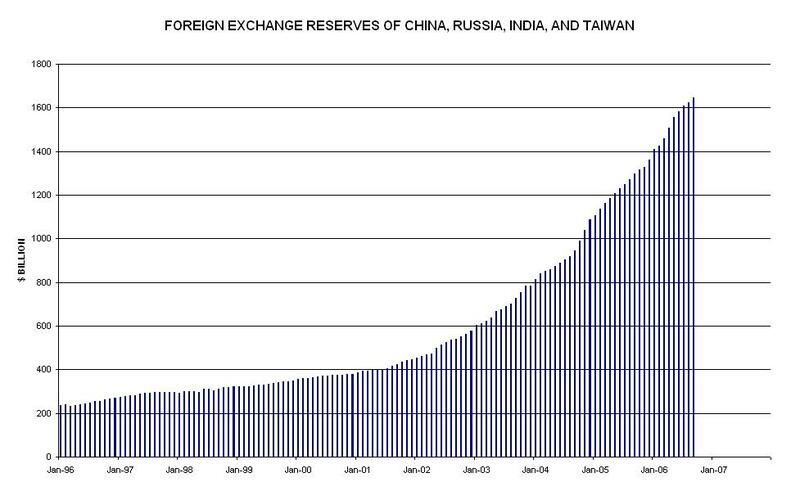 As recently as January 2002, their combined reserves were $452 billion. As of this September, their combined reserves totaled $1.65 trillion. In less than five years, therefore, these four countries have essentially pumped $1.2 trillion into global fixed income markets. To put that number in perspective, it is essentially identical to the entire growth of US M2 during the same period!!!! Even if the bulk of the money is put on deposit or enters the 2-5 year sector of the curve, it is very difficult to believe that this does not have a knock-on impact at the back end as well. 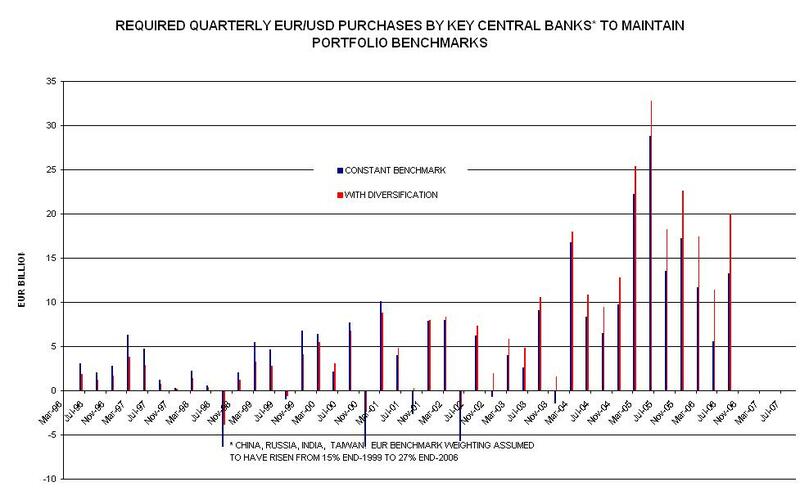 This is especially the case given that a growing number of reserve assets are being farmed out to private sector asset managers with a benchmark duration that might well be higher than those of the central banks’ direct bond purchases. This, Macro Man believes, is one of the principal solutions to the bond market conundrum and the concomitant lack of volatility. Their impact on the currency market is, if anything, more acutely felt. It is Macro Man’s firm belief that EUR/USD would have traded close to parity over the last couple of years had its price been determined solely by the private sector. A 100 bp cash premium has traditionally sufficed to drive the dollar stronger against the EUR/DEM. For the last year and bit, the dollar’s cash premium has been at least double that, with no discernible impact upon the EUR/USD spot rate. Why? Well, as monetary and investment authorities accrue dollar reserves through either FX intervention or oil revenues, the money is virtually all in dollars. To maintain a portfolio benchmark of, say, 25% euros, a portion of these dollars must be sold in exchange for euros (or sterling, or Canadian or Aussie dollars) every month. The chart below illustrates how many euros per quarter China, Russia, India, and Taiwan would need to buy under two scenarios: a constant 25% benchmark weighting, or a gradually rising benchmark weight from 15% in 1999 to 27.5% today. Small wonder the private sector bias to be long dollars at these levels of carry has not had much impact!!! What is the end game? Macro Man wishes he knew. Two things he is watching out for, however, are a European slowdown and a rise in protectionism. In the event of the former, Macro Man suspects that European politicians would seriously countenance intervention to weaken the euro. Such an outcome is unlikely while the ECB remains in tightening mode. However, with presidential elections in France next year, the current government will be acutely aware of the need to maintain sufficient economic momentum to foster a robust labour market. De Villepin’s comments earlier this week, therefore, should be observed through the prism of electoral posturing. The second possible endgame is a rise in concrete protectionism in the west. If the US were to tell China ‘neither your dollars nor your goods are welcome here anymore’, that would likely catalyze a more pronounced sell-off in the dollar, with the private sector happy to coat-tail central bank dollar selling. alpha is the market's cost for liquidity. managers buy/sell in a market becuase they belive there is alpha in it for them. the central banks are removing that alpha from the currency market and as a result money will dry up. 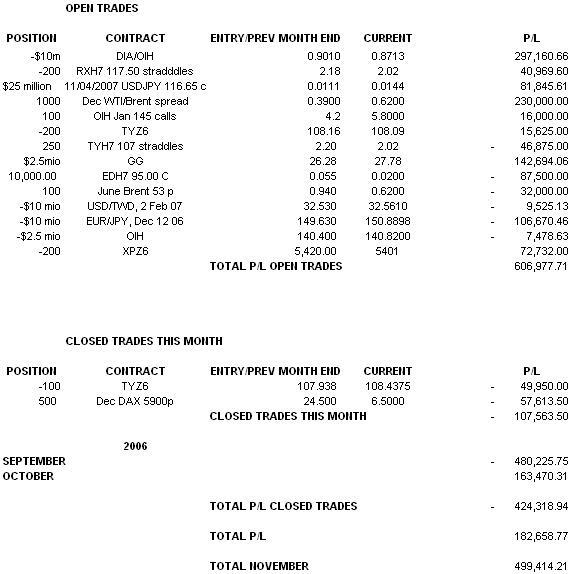 1) currency mandates will be withdrawn; 2) macro managers will spend their risk budget elsewhere than currency; 3) managers will leave the industry becuase its too hard. 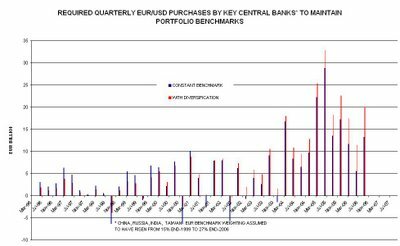 when that happens this hitherto considered infinitiely large market, the fx market, will dry up. the central banks will be unable to recycle the $, multilateral trade will not be possible, globablisation will fail. not sure i agree with your "absent voldemort" euro/$ is at parity argument tho. I see the int. differentials story. but i don't see the non-official private sector flows that sustain the current US current account deficit. And without financing, the currencies of current acocunt deficit countries tank. that said, i believe your basic flows story -- CBs intervene by buying $/ the oil folks get paid in $, so have to sell to keep portfolios balanced. But my strong sense that central banks and oil funds stop selling (ergo end up supporting the $) when private demand for $ dries up. that is clearly the pattern in the COFER data. I liked the Harry Potter, lord Voldemort and Dumbledore analogy. I could not agree more. It is really a surprise that the $1.65 trillion from China, India, Russia and Taiwan has no impact on the back end of the global fixed income market.